Welcome, Dafydd Roche of TI and ExpatAudio! Almost all chips need to be marketed for the mass market now, not single customers. The eardrum tightens when subjected to loud noises. Dafydd has a side business with another UK expatriate called Expat Audio. He has an ECM93 Pick and Place machine. Another rule of thumb is if you’re not going to use the machine weekly, it’s probably not worth it. Watts are often listed as a percentage of THD. 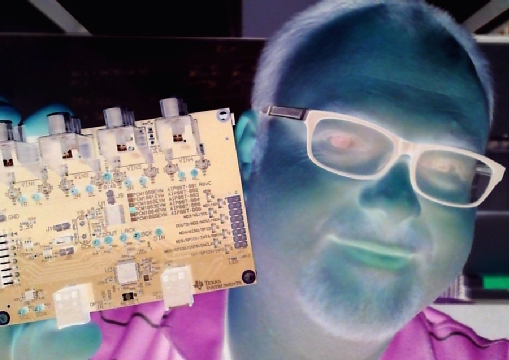 One of the parts Dafydd has helped design is 600W single chip amplifier. NPR did comparisons on bit rates to show that most people can’t hear the difference. 1V RMS signal w/ 130 dB range…ends up being tens of nV at the low end of the scale. Henry Ott was on the show, Dafydd loves his book. Future projects will be remote control of analog, recall setups using storage. Dave, Chris, Thanks for having me on the show. I had a great time. Best episode i’ve listened to in a long time! Fantasticly entertaining and educational. This is the amp hour I love! Thanks for sharing your knowledge, experience and joy Dafydd. And thank you Chris and Dave for such a great interview. This was a great interview. You could probably get another hour of material out of Dafydd. The general rule-of-thumb of 4 engineers = 1M, seems kinda high… assuming a $100k of salary, the overhead for 1 engineer is $250k?! Was this the Hank Zumbahlen application note on ADCs? I guess they need somewhere to work and equipment and software licenses etc. this episode hit the spot excellent. BTW was that Karl from spark gap at the end? Great show, loved Karl’s cameo. When is the Amp Hour interviewing Karl and Corey? As a new listener to the amp hour, I’m absolutely loving this show. Thank you Dave and Chris, keep it up! Very nice guest, very nice interview. Dave had a blogpost a while ago about support forums of companies, if someone remembers, there he posted some statements ( which are pretty true ) that a lot of persons contribute without earning money ( I am in the e2e Forum , that is the Texas Instruments one ). Now, Dave you could have had the chance of talking about that with the guest, did you? Ep. 113, A Little Noddy Program. Guest was Clive Turvey from the STMicroelectronics forums. I design Audio systems and would like to add a point to the discussion about ‘remembering’ sound. After 20 years of working in audio, I can tell you a frequency of a sound by hearing it, just like you can tell me a color by looking at it. Similarly, when you think of ‘Red’, you remember what that color looks like. So by using that learned skill with frequencies, I can actually remember and compare sounds I heard previously. I would also add for the record that I do not believe in, endorse, sell or otherwise use ‘snake oil’ audio products in my designs.